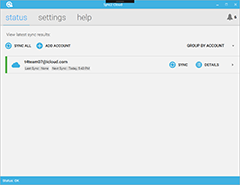 This version of Sync2 Cloud includes a hotfix that resolves synchronization issues when non-default folders are used for synchronization. Due to recent changes to iCloud from Apple Inc., functionality of Sync2 Cloud was affected and your Calendar events and tasks may not synchronize from Outlook to iCloud correctly. The updated version of Sync2 Cloud will synchronize calendar events and tasks even with the latest 2018 Windows October Update. This update now offers synchronization of meetings / events with attendees and their statuses between Outlook, Google and iCloud events. Synchronization of attendees in events is now supported. The attendees’ list and their acceptance status are now synchronized both ways with Outlook meetings, Google and iCloud events. You as owner of a meeting can now make an update to it on any device / source and be sure your meeting attendees are informed about the change. In one-way synchronization scenarios, in case an item was deleted on the source where updates were synchronized to, further updates of this item would not be synchronized. In some cases, the event time would be synchronized incorrectly, when its time was updated from all-day to a specific time slot. Several UI issues that were encountered with higher DPI settings were fixed. When connecting an Apple iCloud account, pasting the password into the field would keep the Login button disabled. The “Welcome” notification shown in the Notifications tab had incorrect date. This update now supports German and French languages. It also addresses several issues encountered by our customers with Google Contacts synchronization. German and French languages are now supported. Users with German or French systems will now see Sync2 Cloud interfaces with these languages as well. Google Birthdays and Holidays Calendars are now available to select for synchronization with Outlook Calendars. Some contact updates made in Outlook were not synchronized with iCloud in some scenarios. The “File As” field in Google Contacts appears empty in some usage scenarios; this field is now ignored, if it’s empty, when synchronizing it with Outlook Contacts. The “Full name” and “Display name” fields in Outlook were not synchronized correctly from Google Contacts in some cases.